There’s almost nothing worse when you’re traveling than getting to your destination only to find that all of your nice clothes have been wrinkled up. Now if you wear them out or to your business meeting you’ll look like a bum and if you don’t have the time to iron them out then what do you do? We’ve ran into this situation a number of times and decided to do some research and find some reliable garment bags that match anyone’s budget. We found garment bags that are as bare bones as it gets and gets the job done for basically nothing. On the other hand we found garment bags I wouldn’t be able to afford in years. This list comprises the top 7 garment bags we think best represent different price ranges. If you’re interested in one you see feel free to read the short review on it below or find out additional info and price by following the links. This is the Bags For Less garment bag and is about as budget strapped of a bag as you can get but it beats putting trash bags over your clothes. The Bags for Less is the best seller on Amazon for garment bags purely because it gets the job done for cheap. Although this is a cheap garment bag, that doesn’t mean its quality is compromised. The inexpensive garment bag here is actually pretty neat in that it’s built to be environmentally friendly. It is made from a recyclable material that is eco-friendly! This garment bag is actually perfect for last minute purchases to cover your clothes on a trip or even if you want to just store something in the closet. It has a full length sturdy zipper right down the center and has a reinforced hanger opening at the top; although it does not come with any hanger, you simply put your own hanger through the opening. These bags only come in the one color shown, black with black trim and seeing as how they are not framed, this makes them great for carry-on travel! If you’re in need of a last minute garment bag, check out their prices now and you’ll probably end up buying a couple. This is the WallyBags 40 inch garment bag. I know what you’re thinking, “WallyBags? What kind of name is that?” I wouldn’t blame you for asking that either. When I first heard the name I thought it was a spinoff of Walmart but luckily it is not. WallyBags actually produce decent garment bags for relatively inexpensive prices. Now compared to the Bags for Less garment bag we just reviewed this might seem pricey but all in all this garment bag is a step up in the right direction for a reasonable price. What I like about this WallyBags is the option of color which allows you to have a sense of identity with your garment bag instead of plain old black. I personally prefer the red but there are three other colors in addition to black as well. WallyBags features include securing your own hangers at the very top of the bag which means that your clothes will not fall to the bottom of the garment bag and it allows for quick and easy packing. However you have to lay down the bag on a bed in order to use this clamping feature. 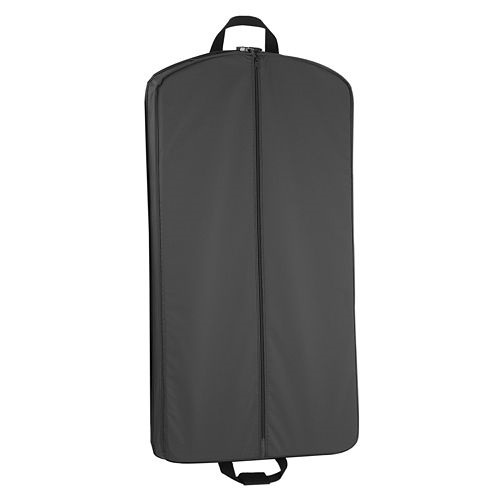 This garment bag is capable of holding up to 6 pieces of clothing all while keeping it somewhat wrinkle free. It won’t do as great of a job as some of our other bags on this list but it gets the job done. Lastly there is a full length zipper that runs down the middle of the garment bag, the handles are able to be fastened together which makes carrying the bag around much easier and of course it is able to be used as a carry-on! This is where the list starts to get good. We actually start to get some decent garment bags have a bit more functionality and style. This is the Travel Select Amsterdam garment bag. 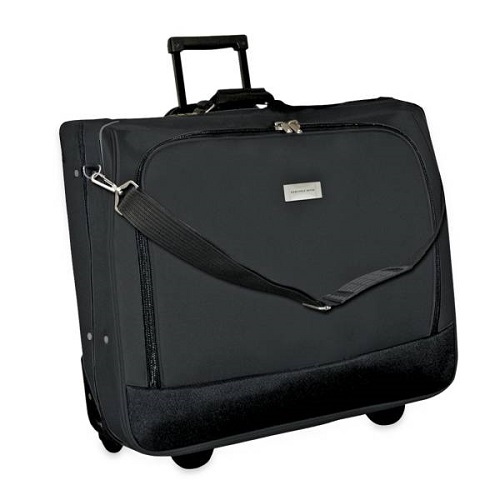 This Travel Select garment bag comes in 4 colors, black, grey, red and navy. It’s made of 1200 denier polyester which provides exceptional durability. It also has a reinforced front panel to protect your garments while traveling. As the name implies this is obviously a rolling garment bag that is built with two in-line skate wheels, it also has an internal handle system, a detachable and adjustable shoulder strap with a non-slip pad. The Travel Select garment bag has some decent organization going for it. It has a zippered mesh pocket on one end and two corner pockets on the opposite side as well as non-zippered mesh pockets on the side which can be used for accessories or even possibly your shoes. There are tie straps that are very convenient to use while also using the fold out design as these two combined helps to reduce wrinkles for when you arrive at your destination. Nobody wants to have to deal with wrinkly suits or dresses! Finally the most important question in regards to garment bags, is it able to be used as a carry-on? Unfortunately not this garment bag. 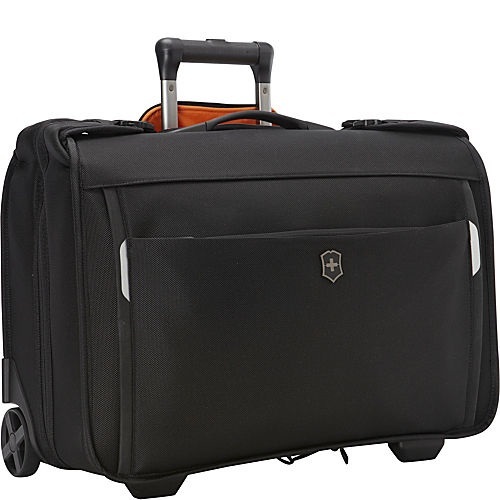 But a great alternative to this bag if you need something that is a carry-on and in the same price race is the Mercury Executive Tri-Fold garment bag. It is carry-on approved and looks great as well, if you’re interested in learning more check out the reviews and price here! I never thought I would say this but this garment bag actually intrigues me. First off the way it is opened is almost like using a suitcase which makes packing so much easier but the part I really like is the shoe compartment. This is the Geoffrey Beene garment carrier. It is offered in two colors being black and olive, which tend to be the most common colors for garment bags apparently. It is made of polyester and has some great functionality. The exterior of the bag includes an outside pocket for documents, accessories or other items you may need in a hurry. A telescopic handle to allow you to roll it along the airport with ease and obviously two in-line skate wheels that do a fantastic job of navigating busy terminals. On the inside we have some great organization set up which allows us to pack about 4 suits into this rolling garment bag. We have tie down straps and two corner mesh pockets on one side with a hanger clamp. The other side offers us two large mesh pockets for our folded shirts. Again the obvious question about this being carry-on comes into play and this one as well is not able to be used as a carry on. A perfect alternative for the ladies is the Cinda B Slim garment bag which looks absolutely amazing. For the guys or girls who don’t want something girly we found this Delsey Paris Helium Sky garment bag. Both of these have a similar price range and are carry-on approved! 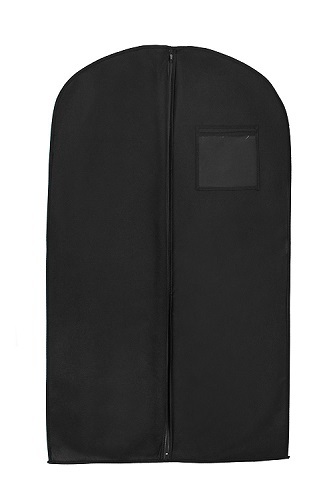 This is the Cambridge garment bag by London Fog. 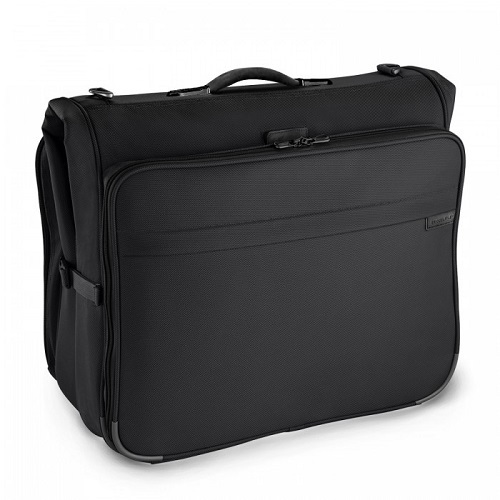 It is a moderately priced rolling garment bag that provides quite a bit of functionality. The design of the Cambridge comes in two different styles, a black and white look and an olive look. Personally the black and white is the way to go! 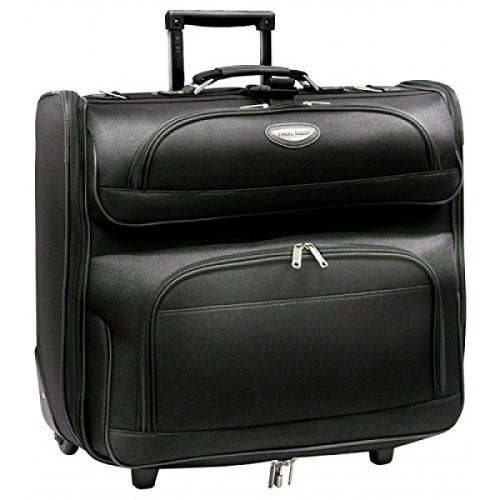 The obvious benefit of acquiring this garment bag is the fact that you can roll it and London Fog included 2 in-line skate wheels that are made of polyurethane to provide a very quiet and smooth ride. Examining the exterior of the bag you will also find dual carrying handles that not only look great but are extremely comfortable to handle. You will also find one external pocket for accessories or important documents you may need at the last minute while going through security. London Fog’s Cambridge has excellent organization on the inside. There are 6 zippered pockets/pouches in total, straps to hold your clothes in place, a section dedicated to holding your shoes as well as luggage clamps and a hook to hand the garment bag once you reach your destination. The only downside is if you needed this to be a carry-on bag then unfortunately it’s not up to the task. As an alternate option, ladies you might find this Vera Bradley Going Places garment bag to be to your liking if you want something feminine that’s a carry-on. Otherwise, I would suggest the WallyBags 45” Garment Bag with Shoulder strap. It provides exceptional functionality and is a carry-on. This is the Victorinox Werks Traveler 5.0 Garment Bag and actually my favorite on the list. Unfortunately it’s just a tad bit outside of my price range. It has an amazing style though that is hard to turn away from with a black exterior and orange interior that just makes it pop! Inside you will find a hanger clap to secure your garments and a foam bolster compression strap to minimize wrinkles. No longer do you have to deal with wrinkly suits after you reach your destination! To round off the inside there is also an extension panel that allows it to hold longer items, two removable mesh storage cubes, a large zippered mesh pocket which is perfect for shoes and a zippered mesh tie pocket for additional storage! A great feature about this product is that it is a rolling garment bag so there won’t ever be a need to strap it over your shoulder and lug it around. It has two 80mm inline skate wheels. Finally one of the most important features of this bag is that you are able to take this as a carry-on garment bag onto the plane! This is the Baseline Deluxe Garment Bag by Briggs & Riley. Probably one of the best brands of luggage you could consider on the market and this carry-on garment bag is no exception. The Baseline garment bag does have a pretty standard look with black and olive as their two colors to choose from, so nothing flashy from Briggs & Riley here. Briggs & Riley provide us with great space to work with to pack anywhere from 4 to 6 suits which is perfect for a week long business trip. They’ve added a removable extension panel which allows it to accommodate longer garments, whether it is suit pants or dresses. Inside we will find 4 separate zippered compartments on one side, 3 of them being mesh. On the other side we have two more zippered mesh pockets in the corners and elastic pouches on the bottom which are perfect for shoes. There is also a removable waterproof pocket that is snapped into place. This garment bag also comes with a removable shoulder strap with a non-slip shoulder pad and a couple garment bag hooks as well. The outside is made with a tough ballistic nylon but if that doesn’t hold up, Briggs & Riley have a lifetime warranty that even covers airline damage; by far the best warranty in the business. 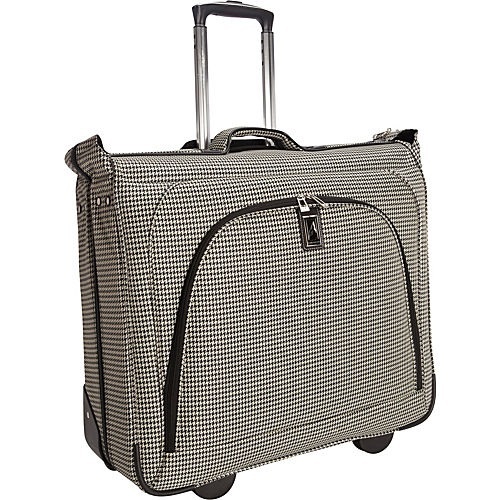 And to answer the most popular question, this Briggs & Riley Baseline garment bag is able to be used as a carry-on! When looking at garment bags there are a couple factors that come straight to mind that we would want to cover. To start the first thing that seems blatantly obvious that we would want out of a garment bag is, does it keep our clothes wrinkle free? This is simple, if the answer is no, it doesn’t get on the list. If it does, then I want to see what unique features this particular garment bag may have and what is keeping the clothes wrinkle free. Also how is the organization of the bag, does it only have a central compartment for clothes or does it organize the inside and outside of the bag to maximize storing capacity. One factor that is not as high on this list is if it is able to be used as a carry-on. Now most people might say “but that’s the most important part”, well it’s a consideration but not everyone that uses a garment bag needs it to be a carry-on. Many people who use garment bags are traveling by train or automobile or even ship. For those bags in the list, that did not meet carry-on requirements, I offered comparable alternatives. If you think there are better or additional garment bags I should consider, please leave a comment below!